A honey-gathering insect frequently referred to in the Bible. 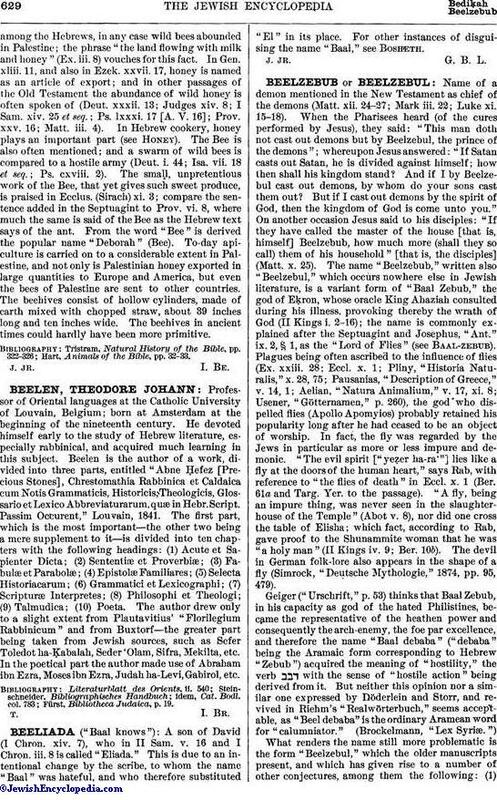 Bee-keeping dates very far back, and it is quite probable that the ancient Hebrews were engaged in it, although there is no direct testimony on the subject either in the Old or in the New Testament. Isaiah vii. 18 is usually quoted in evidence, and the phrase "the Lord shall hiss . . . for the bee" is explained as a technical term of apiculture, meaning to entice the bees to the hive; but the correctness of this supposition may be questioned. It would be more justifiable to quote II Chron. xxxi. 5, where reference is made to the first-fruits of honey. 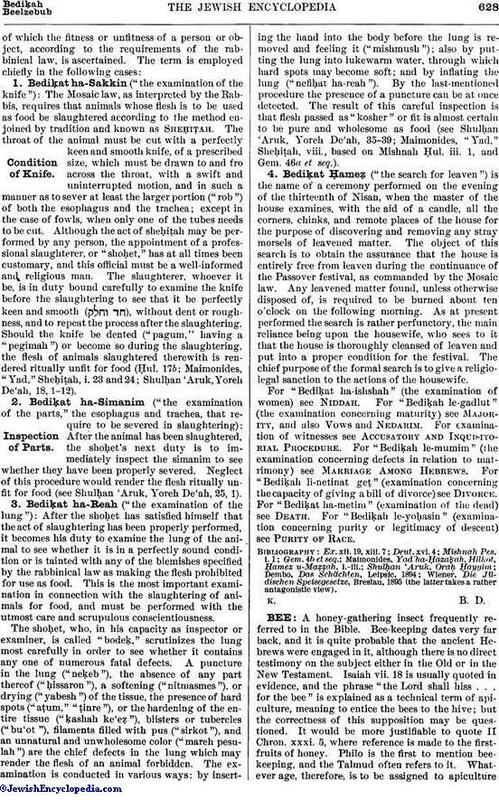 Philo is the first to mention beekeeping, and the Talmud often refers to it. Whatever age, therefore, is to be assigned to apicultureamong the Hebrews, in any case wild bees abounded in Palestine; the phrase "the land flowing with milk and honey" (Ex. iii. 8) vouches for this fact. In Gen. xliii. 11, and also in Ezek. xxvii. 17, honey is named as an article of export; and in other passages of the Old Testament the abundance of wild honey is often spoken of (Deut. xxxii. 13; Judges xiv. 8; I Sam. xiv. 25 et seq. ; Ps. lxxxi. 17 [A. V. 16]; Prov. xxv. 16; Matt. iii. 4). In Hebrew cookery, honey plays an important part (see Honey). The Bee is also often mentioned; and a swarm of wild bees is compared to a hostile army (Deut. i. 44; Isa. vii. 18 et seq. ; Ps. cxviii. 2). The small, unpretentious work of the Bee, that yet gives such sweet produce, is praised in Ecclus. (Sirach) xi. 3; compare the sentence added in the Septuagint to Prov. vi. 8, where much the same is said of the Bee as the Hebrew text says of the ant. From the word "Bee" is derived the popular name "Deborah" (Bee). To-day apiculture is carried on to a considerable extent in Palestine, and not only is Palestinian honey exported in large quantities to Europe and America, but even the bees of Palestine are sent to other countries. The beehives consist of hollow cylinders, made of earth mixed with chopped straw, about 39 inches long and ten inches wide. The beehives in ancient times could hardly have been more primitive. Hart, Animals of the Bible, pp. 32-33.